The World Trading Organization (WTO) is not ideal but it is the only universal trade platform while the Trans-Pacific Partnership (TPP) and the Transatlantic Trade and Investment Partnership (TTIP) are encroaching upon its sphere of responsibility, Russian Prime Minister Dmitry Medvedev said Tuesday. DVORIKI (Russia) (Sputnik) — "The WTO is not ideal but it is the only universal platform that defines the rules of the game throughout the global economy. But the WTO is being encroached upon, in particular, you know that… there are projects like TPP and TTIP," Medvedev said at the Terra Scientia international youth forum. He added that the attempts to fragment the regulatory field of the global economy will lead to the "destruction of world trade." The WTO is a global international organization that regulates international trade. It has 164 member states. In October, 12 countries of the Pacific Rim region, including the United States and Canada, reached an agreement on the TPP trade deal, intended to deregulate trade among the signatories, which together make up some 40 percent of the world economy. The deal has yet to be ratified by the signatory countries. Since 2013, the United States has also been negotiating the TTIP deal with the European Union, which involves the creation of a free trade zone. 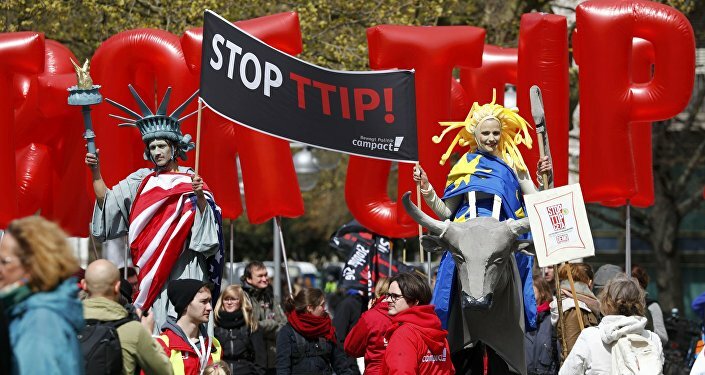 Such countries as Canada, Mexico, Switzerland, Liechtenstein, Norway and Iceland are also due to participate in TTIP.